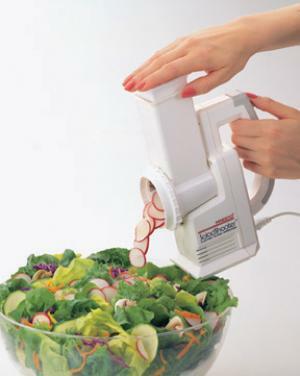 This SaladShooter(r) slicer/shredder takes the work and mess out of slicing and shredding vegetables, fruits, cheese, nuts and more. It's perfect for making salads, soups, pizzas, tacos, and desserts. Shoot one ingredient after another right where you want. There are no extra bowls to clean. Simple to use too! Interchangeable slicing and shredding cones slip right in. Its compact size makes it easy to store most anywhere, even in a drawer.